Nokia 8 Is Official, Up For Pre-Orders In Australia, Germany & Russia - AndroGuider | One Stop For The Techy You! Following multiple leaks and rumors, HMD Global took wraps off the Nokia 8 a couple of days back. 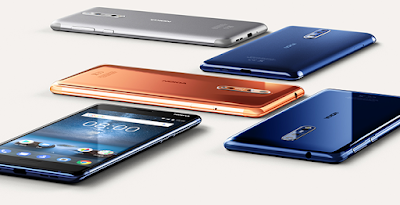 Nokia's first Android flagship smartphone sports a 5.3" QHD IPS LCD panel which is backed by 2.5D Gorilla Glass 5. The handset also packs in 4GB RAM coupled with Snapdragon 835, 64GB of expandable storage and a 3090mAh Li-Ion battery. The phone is certified as IP54 which makes it resistant to dust ingress and water splashes. HMD decided not to hop on the bandwagon of smartphones with minimum bezels as the trend has been with the LG G6, Galaxy S8 and the Sharp Aquos S2. Thus for a 2017 flagship, Nokia 8's design isn't something remarkable. The phone's design language is similar to that of the earlier announced Nokia 6. 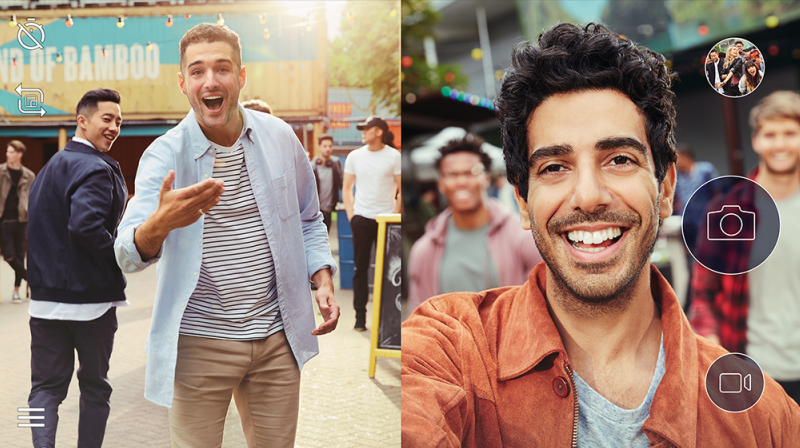 Nokia 8's trademark feature is "bothie" (an apparent combination of the words 'both' and 'selfie') aka Dual-Sight. This feature allows capturing photos and videos from the front and the rear camera at the same time. The footage captured from both the rear and the front lens is then arranged in the form of a split screen as shown in the image below. The OZO spatial 360-degree audio ensures that the audio in videos and sound recordings turns out to be good. You will also be able to live stream the captured video footage (bothie or video from the either lens) to YouTube, Facebook and Periscope from the in-built camera application. The Nokia 8 has dual 13MP (color monochrome, f/2.0, OIS) rear camera setup along with a 13MP front facing camera (f/2.0) which possesses Phase Detection Auto Focus. The engineers at ZEISS have helped design both the Nokia 8 cameras. The Nokia 8 will be available globally in September at €600. The device can be pre-ordered from JB Hi-Fi in Australia, O2/Mobilkom Debitel in Germany and Megafon in Russia. In case of Australia, JB Hi-Fi is offering the device for AUD 899 (US$712). Pre-orders will start shipping from September 7. In Germany the Nokia 8 can be purchased from O2 without contract for €577 and from Mobilkom Debitel for €579. If you choose to pre-order from O2 you will get a Nokia smartwatch worth €129.95 for free. In Russia Megafon is offering the Nokia 8 for €575 in all the four colors Blue Satin, Blue Polished, Silver and Copper. The image below showcases the Nokia 8 in all the color variants in the order mentioned. The Nokia 8 is powered by a stock version of Android 7.1.1 Nougat. HMD has assured that the Nokia 8 will be quick to get Android O, which is expected to be released tomorrow. HMD already provides monthly security patches to the trio of Nokia 3, 5 and 6. It is expected to follow suit for the Nokia 8.